I am a psychotherapist serving Denver, Westminster and surrounding areas. I have been working as a mental health professional since 2003. I founded Empowerment Therapy Services LLC in 2010 to provide counseling services to adults, individuals and couples. I enjoy working with people who have a wide variety of problems and concerns, and I specialize in anxiety, mood disorders and Divorce Recovery. One of my overarching goals is always to empower you to live your best life as you define it. One of the most important factors in successful counseling is the relationship between therapist and client. To help you decide whether I am the right counselor for you, I offer a free phone consultation. Call me for a consultation or to schedule an appointment at 303-549-7087. 50 minutes sessions are $110/session. 1 hour and 20 minutes are $150/session (recommended for couples and families). Unless otherwise discussed, payment is due at the end of each session. I accept cash, check or credit card. I offer a sliding scale to those who qualify. I accept Colorado Medicaid, Anthem Blue Cross/Blue Shield and Cigna. I am happy to discuss the limits of confidentiality in greater detail over the phone or in person. Phone calls and *emails will be returned within 24 hours. *Please note that although I take all reasonable precautions to maintain confidentiality, email transmission cannot be guaranteed to be secure or error-free as information could be intercepted, corrupted, lost, destroyed, arrive late, be incomplete, or contain viruses. I do not accept liability for any errors or omissions in the contents of email, which arise as a result of email transmission. Also, I do not control who has access to your email or who may be looking over your shoulder when you access your email and I accept no liability for these types of confidentiality breaches; to reduce the risk of breaches to confidentiality, use strong passwords and consider the visibility of the computer screen when accessing your email. My approach to couple's counseling (and therapy in general) is to look for your strengths and build on them. Most couples report communication difficulties as a major concern in their relationship. As such, I also provide strategies to improve communication and address the emotions behind the communication. If you are considering couple's counseling, don't wait! The best outcomes for couple's counseling occur when both partners are invested in the relationship and the problems are seen as fixable. Often times, couple's counseling is seen as a last resort and couples wait to seek counseling until the problems are out of control and one or both partners has given up. At this point couples, counseling becomes a much more difficult and expensive process. Gain the tools you need to maintain and improve your relationship now, not the tools that you could have used five years ago. When a divorce happens, it means that a life path has ended for the people involved. It is no secret that approximately half of all first marriages and over half of all second marriages end in divorce. Divorce is often a very painful process where people experience grief, loss, guilt and isolation. It is common for people involved in divorce to become depressed, anxious, angry sad and confused. My job is to help you deal with the emotions, grief and loss that come with a divorce. As you forge your new path, I want to provide you with strategies to adjust to your new self as a divorced person in the healthiest way possible. You will make it. Let me help you through. In addition to providing individual counseling to aid in you as you move through this process, I facilitate low-cost counseling groups specific to Divorce Recovery. A group setting can remind you that you are not alone. Space is limited. Call me at 303-549-7087 to find out how to reserve a spot in the next group. The "co" in co-parenting is for cooperation. To co-parent effectively ex's must put aside their differences and focus on what is best for the child(ren). This is often easier said than done. There are plenty of horror stories about the devastating effects of divorce on the children who are caught in the middle. 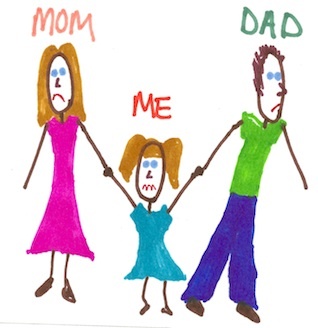 Parents don't mean to let their children get caught in the crossfire but divorce and the aftermath is a mentally and emotionally draining process that can cloud judgment of even the best parents. When parents come to me for help during or after their divorce, it is a sign of courage and commitment to their children. I use my objectivity and developmental expertise to help you and your ex (and step-parents) come up with the best ways to work together with the common goal of raising happy, healthy and well adjusted children.